The Coat of Jaws is made up of three distinct creatures--two winged reptilian creatures holding a toothy skull. An excellent family crest if you suspect your family tree has been a little misshapen and thorny. Perfect over a fireplace or doorway to add a certain macabre grandeur to your estate. This piece is also available as a candle holder--the forward arm of each creature angled downward to light the skull from the side. 30" wide, 23" tall, 3" deep. 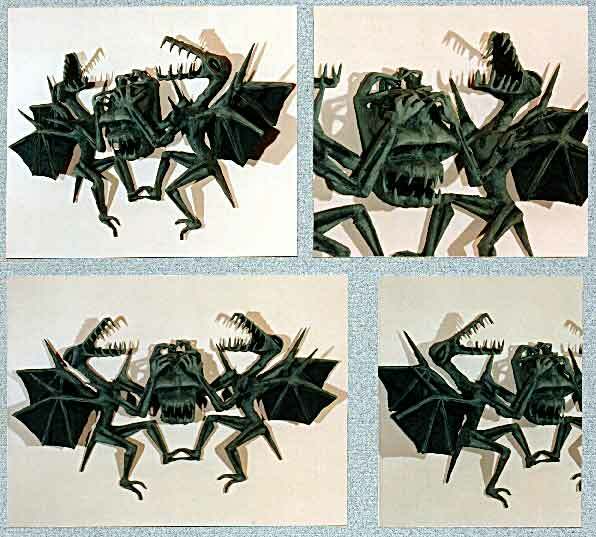 Two winged reptilian creatures holding a toothy skull. If you would like this item, write me or call me. The Price is $125. I accept checks or money orders (I do not accept credit cards for security reasons). Make check or money order to Larry LoPresti.